Beinn Eighe in 1951 was a place a lot different from today, it was a remote area with simple roads and though one of the best mountains in Scotland was in winter a serious undertaking. Beinn Eighe is the bulkiest of the trinity of great Torridon peaks in the far North West Of Scotland. The western half of its ridge contains both of its two Munro’s. This section of the ridge makes a fine traverse with magnificent views; it may involve less scrambling than Beinn Alligin or Liathach, but compensation comes when Coire Mhic Fhearchair is reached during the descent; this is the most spectacular of all Torridon’s corries. This is where in 1951 a young Joss Gosling was sent to an aircraft crash. These are the words of the late Joss Gosling who was a member of the RAF Kinloss MRT who was there in 1951 He amazingly took some photos of the crash and it of huge historical interest of these early days. Joss sadly passed away recently he was a lovely man who taught us all so much every year I visit the crash site on Beinn Eighe with some of Joss family and Geoff relative of one of the crew. We have a new slate plaque bought by the family and Geoff to put on the propeller and this will be done as soon as winter is over. 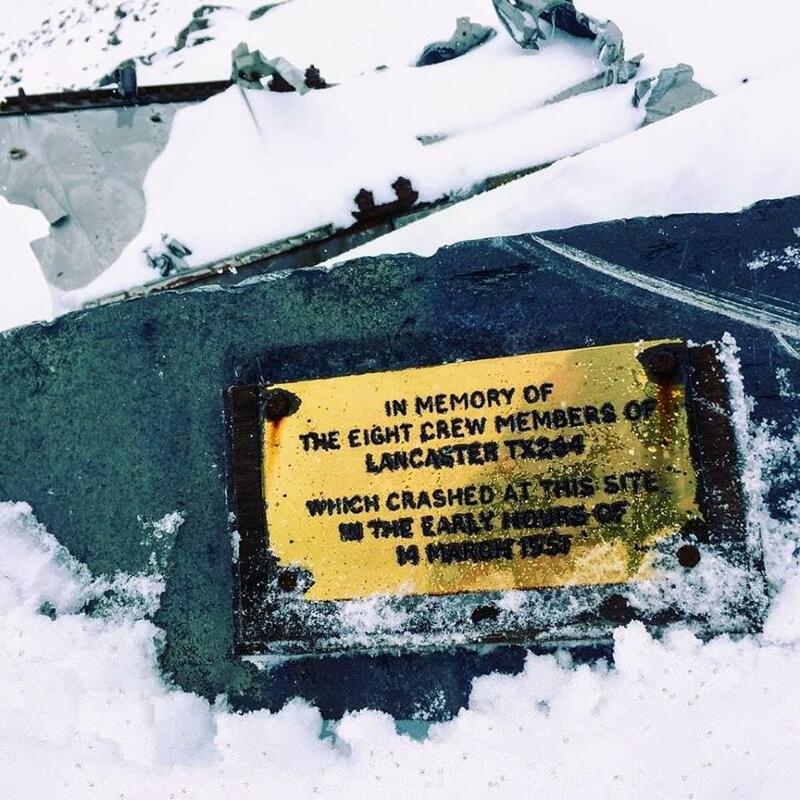 A Lancaster bomber, from RAF Kinloss which had been converted for maritime patrol duties, crashed near the summit of Beinn Eighe, in Wester Ross, in March 1951. All eight crew from, RAF Kinloss in Moray, died. Following the crash he and the other members of the RAF Kinloss search party loaded rescue equipment into trucks, but they remained on stand-by for two days. Mr Gosling said: “Nobody knew where it was and we couldn’t go anywhere until we found some destination. Mr Gosling said the team were well equipped by 1950s standards for wintry conditions in the hills. They had studded boots, wind-proof clothing, sou’wester hats and capes. However, he said they were lacking knowledge of the area. A non-commissioned officer (NCO) had been to Slioch, another mountain in the area, but Beinn Eighe was new ground for the team. Mr Gosling said: “Nobody really knew much about it.” As far as I know nobody had ever ventured into that area. You were going into the unknown.”At first the team found wreckage before eventually finding bodies near the summit. Mr Gosling said: “It was the first time I had seen a body. But we were doing a job and got stuck into it.” Difficulties in recovering all the bodies over several months led to the formation of RAF Mountain Rescue. Most of the wrecked Lancaster was understood to have been destroyed in a later controlled explosion, but large sections of wing and its Rolls Royce Merlin engines remain. A small brass plaque on part of the wreckage recalls the accident and the area is known as Fuselage Gully. My views on memorials on the hills are well known but as this is attached to the propeller I feel it is in need of updating with something that will not need replaced. From the RAF Mountain Rescue Service Facebook page. “There was a return to a historically important location in the history of the RAF Mountain Rescue Service for some of the RAF LossiemouthMRT troops on the weekend as they conducted a day’s training on Beinn Eighe. 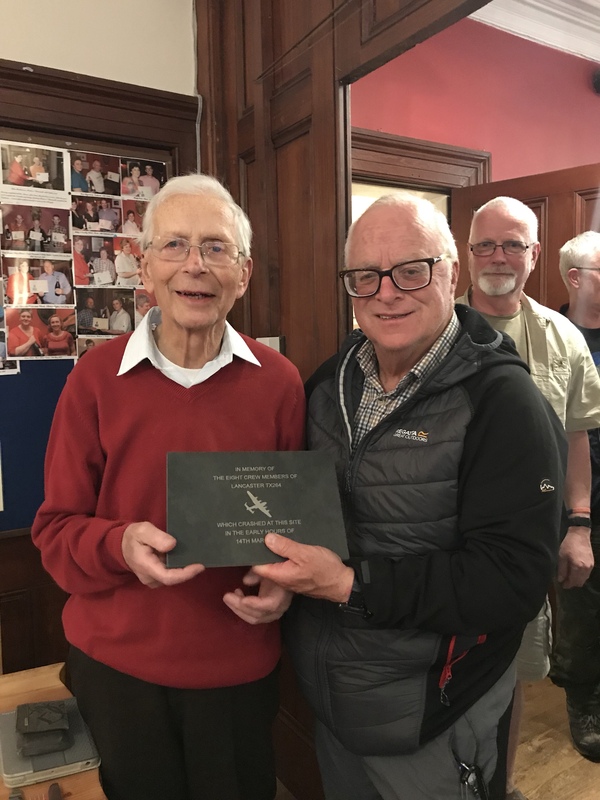 2018 May the late Joss Gosling and Heavy with the new plaque. If you have the privileged to climb Beinn Eighe visit the huge Coire where the Triple Buttress are. It is like a “Cathedral” with the three Buttress like organ pipes let your mind go back to the winter of 1951 and what happend here. It is humbling and poignant. Be aware that once you leave the loch and the screes this is a serious place to be especially in winter. Please leave the crash site as you found it, is a specail place and one that will move you with the surroundings and the beauty of this wild Corrie. My blog has several articles on the Lancaster crash, comments as always welcome. This particular crash had a considerable influence in changes to RAF Mountain Rescue later on. The crash aroused and held the attention, even curious with that desire to know the true facts, rumours do circulate by ‘word of mouth’ at happenings like this one and for some considerable time. The lines of communication in the early fifties were still a newspaper, local or national, or the ‘Wireless’, very few people had a telephone and Television was in its infancy. ‘News of this kind was news’, where to listen or read would create an ‘image’ in the mind. Headlines in the ‘Press and Journal’, Aberdeen, were – Search of hills for missing Lancaster, Missing plane sought in Sutherland, Aberdeen. Pilot on missing plane, Where the missing bomber crashed, Plane wreck not yet reached. It is a sad story as anything of this nature is, particularly for the members of the Rescue Teams but does indicate without doubt ‘special significance’ or ‘emphasis’ on Mountain Rescue, with the extreme difficulties, along with mistakes, these teams faced in that day and age. A detailed description of particular places and local features from Maps had to be the main concern and fully understood. Beinn Eighe is a name, aggregated, for Peaks similar to each other or bearing a definite relation to the one preceding it. This mountain in winter is one of Scotland’s great peaks and accessible only by mountaineers. The gully where the main wreckage is a loose tricky ascent in summer and should only be attempted by mountaineers. The following narrative relates the events of the Beinn Eighe crash on the 14th March 1951 until the 27th August, a very harrowing rescue mission undertaken by the RAF MRS, and civil MRS, despite being called out in all weathers of extreme severity and inhospitable terrain, are all volunteers. On the 13th March 1951 at 1804hrs, Lancaster TX264 call sign ‘D’ Dog of 120 Squadron, converted for reconnaissance purposes, took off from RAF Kinloss, a ‘fog free’ climate of the Moray Coast between Lossiemouth and Nairn. The pilot was Flt Lt Harry Reid DFC, 24 years of age, a total crew of eight with a Second Pilot, Navigator, Flight Engineer and four signallers. It was a ‘Navigational Exercise’ via Cape Wrath, the very name a ‘mingled feeling of anger and disdain’ this being the extreme north-west point of the Scottish mainland and named after the Viking word ’hvraf’ meaning a turning point where the Vikings turned south to the Hebrides in the ninth century. The cape is isolated and its heathland untamed. Around midnight the aircrew flew over the Lighthouse. The last position, sent by radio was at 0127hrs 60 miles north of the Cape, this was the very last message from the aircraft. At 0200hrs a boy living in Torridon, on the east end of Upper Loch Torridon, looking through his bedroom window saw a red flash in the distance, but didn’t think any more about it until he saw the headlines in a Newspaper, ‘Missing Plane Sought’ and this was two days after the aircraft went missing. He mentioned it to the local Postmaster who immediately contacted RAF Kinloss. Similar reports had been received. An Airspeed Oxford was sent to search which concentrated on Beinn Eighe. The wreck of the Lancaster was sighted on the 16th March. On the 17th March the Kinloss RAF Rescue Team arrived in the area and on the 18th approached Beinn Eighe from the North and into Coire Mhic Fhearchair from Loch Maree. Wreckage from the Lancaster was found after arriving at the foot of the Triple Buttresses and lying in the ‘corrie’. A ‘corrie’ is a semi-circular hollow or a circular space in a mountain side. This particular wreckage had fallen, the bulk of the aircraft being much higher with the crew inside. At the foot of the Western Buttress were the port wing, undercarriage, two engines and various cowlings. On the following day the starboard wing and some other parts had been blown down by the strong winds, but still no fuselage. The next day another party managed to climb higher and spotted the fuselage, burnt out, but couldn’t reach it. Further attempts were abandoned for the time being. The weather over the whole period of the search was ‘exceptionally’ severe for the time of the year. It was intensely cold with constant snow showers and high winds and temperatures well below freezing at night. The North of Scotland is much closer, in fact ‘considerably’ closer to the Arctic Circle than North Wales. Conditions in winter can be more ‘Alpine’, they may be ‘Artic’. Between Beinn Eighe and Sail Mhor the weather was absolutely ‘atrocious’, with the wind coming over the ridge with such force it was virtually impossible to move, and the snow anything from one to four feet. The gully from the corrie was a solid sheet of ice. It was certain that no one was alive in the wreckage, and in the opinion of the Officer in Charge of the team the wreckage was so situated it couldn’t be reached by any members of the public unless they were ‘highly experienced climbers’. The CO at RAF Kinloss, in the meantime, had offers from the Moray Mountaineering Club, a Doctor John Brewster with this Club having considerable climbing experience in Winter. This offer and another suggestion for help from the Scottish Mountaineering Club, holding their Easter meeting at Achnashellach to the South of Beinn Eighe were both declined. On the 24th March Dr Brewster informed the CO that men from the Moray Club were going to Beinn Eighe on their own initiative, the RAF team were ordered to return to base. Five men from the Club arrived at Torridon and attempted to reach the aircraft but of no avail and didn’t make a further attempt. Another attempt was made by a Royal Marine Commando, Captain Mike Banks and Angus Eskine. After a really difficult time with the weather, particularly gusts of wind that brought the human body on all fours, these two reached the main bulk of the aircraft. 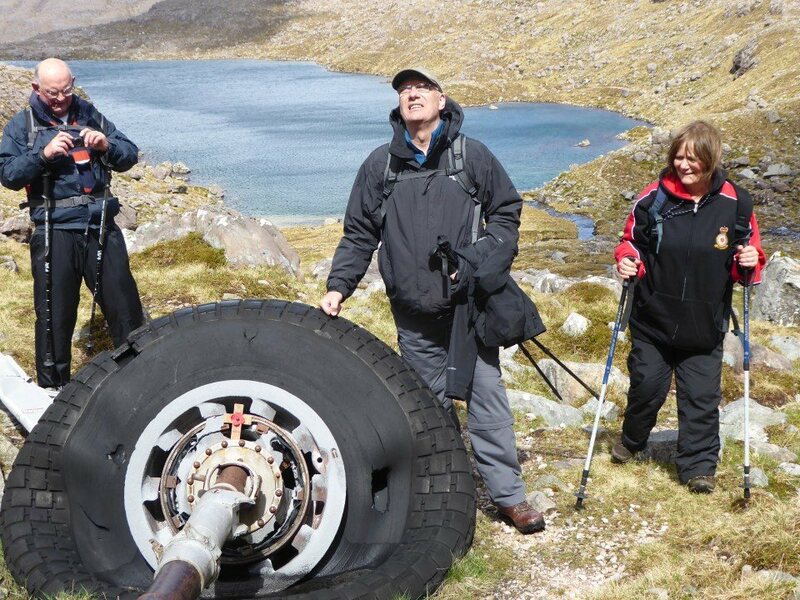 Eventually all unauthorised visits were stopped and the RAF Team once again returned to Beinn Eighe and this time reached the wreckage. It was most difficult and dangerous work recovering the bodies; three were actually in the fuselage. The last body was not recovered until 27th August. Rumours, idle gossip as always, flourished that the crew had survived the impact but rescue being too late. It was obvious to the rescuers, and verified by the medical authorities that death was ‘instantaneous’ in all cases. After the last body was recovered the team sent the large pieces of the fuselage and wing hurtling down the gulley and later came to be known as ‘Fuselage Gulley’, much of it remains to this day. Five of the crew of Lancaster TX264 are buried in Kinloss Cemetery, set in the peaceful grounds of the ruined Abbey, they are Sgt W D Beck, Sgt J W Bell, Sgt R Clucas, Flt Sgt J Naismith and Flt Lt P Tennison, in a section reserved for many aircrew who have died flying from RAF Kinloss over the years. On the 28th August 1985, a group of Officer Cadets led by Sergeant Jim Morning and Sgt Tom Jones were airlifted on to the summit of Beinn Eighe by a Sea King Helicopter from 202 Squadron. One of ‘D’ Dog’s propellers was recovered and put into a lifting net and taken by the helicopter to the road, and then to RAF Kinloss. The twisted three-blade propeller now stands outside the wooden Mountain Rescue Section building as a permanent memorial to ‘D’ Dog’s crew. The gully where the aircraft crashed is called by mountaineers Fuselage Gully and one of the propellers has to be climbed over and is used by climbers as a belay in winter. The standard of a Mountain Rescue Team, of even the rescue service as a whole fluctuates considerably and, sometimes, alarmingly. Several factors contribute to this. For many years there was ‘National Service’ eighteen months to two years. A Man would be trained as a good mountaineer and when competent he would be lost to civilian life. Sometimes several members would be demobilised at the same time. Not only would it be imperative to find new volunteers but also men to train these novices, also the teams had to be commanded. 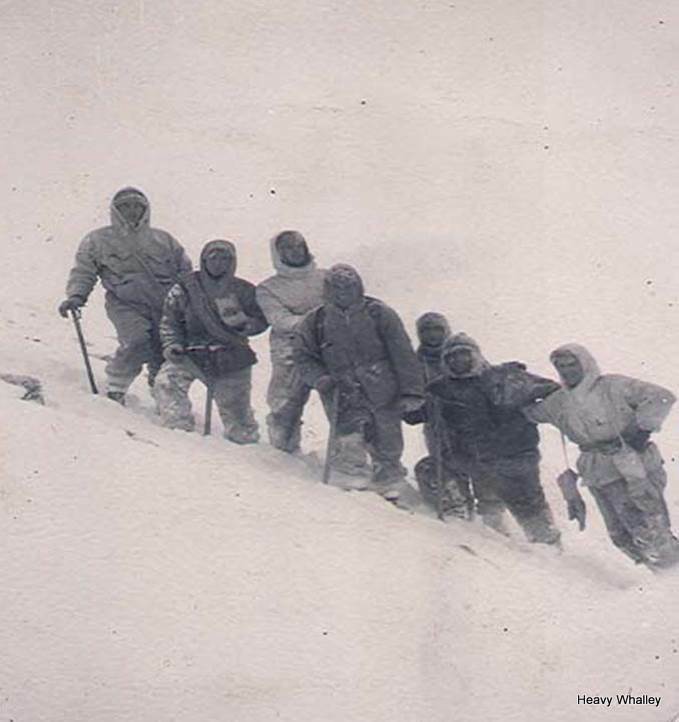 To say that they were sometimes led by incompetent men is unfair and misleading, but because there might be no experienced men available at one time, they were often led by Officers and NCO’s who would be incompetent to deal with emergencies, even those which might appear simple problems to the experienced mountaineer. Sometimes, and by chance, the fault might be corrected in time, for with tact a good team could teach an Officer his job (although no team will tolerate an inefficient NCO. Either the NCO will go, or the good men and therefore, the standard of the team). Tact was required on both sides and when life is in the balance, as it always is on rescues, feelings ran too close to the surface. The fewer experienced mountaineers in a team, the more tolerant prevailed. As the Service took shape and experienced men were in the majority the teams worked more smoothly, and with, as it were, less emotional involvement. 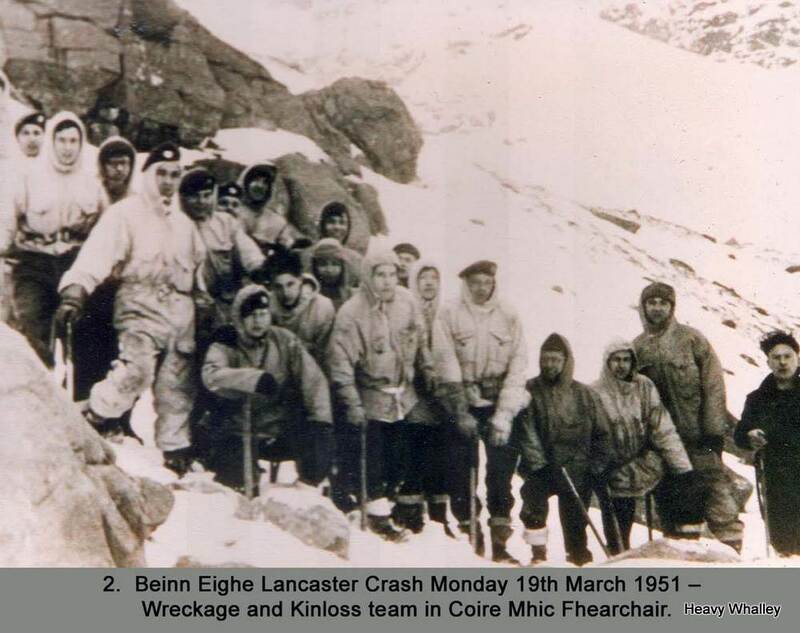 Teams at the start of 1951 were inadequately equipped and poorly trained, but where – in Wales – this knowledge was confined to the RAF, in Scotland the repercussions of the Beinn Eighe disaster were widely publicised. About this time two Medical Officers Berkeley and Mason who had put forward suggestions for improved efficiency came to the notice of the Air Ministry. It was largely due to the efforts of these two Medical Officers that the organisation and training of the teams underwent a drastic change in the following year. I was very privileged to have my last weekend before I retired from the RAF in this area as a member of the RAF Kinloss mrt. This area due to its history is unique and I have spent many days enjoying these peaks. The “Torridon Trilogy” Beinn Eighe, Liathach and Beinn Alligin became test pieces for team training first in summer then in winter conditions. Many of the classic climbs in summer and winter were climbed by team members and a few epic callouts over the years. These hills have huge corries and alpine ridges where rescues have occurred mostly not reported by the National Press. The local Torridon Team and the RAF MR have assisted climbers and walkers over the years. I have climbed Fuselage gully on many occasions with team members during my 37 years with the Mountain Rescue Service. In early Dec 2007 with two of the young, Kinloss Team members we had a special day. This was my last day with the RAF before I retired. It is a fairly simple climb by modern standards but I broke a crampon at the beginning and it made the day very interesting as we were being chased by a big storm as we descended. One crampon on the steep descent was thought provoking and I can only think of how the team in 1951 with their simple kit coped. I was brought up to respect the history of this majestic area and its people; there was no finer place to spend my last weekend than in this special place. On my retirement I spend a two great years with the Torridon MRT as a team member. Finally retired from Mountain Rescue it is a great privilege to return to and enjoy the beauty of this mountain, its ridges, corries and wild life. Recently in 2009 two well known climbers were avalanched whilst descending from Fuselage gully and the wreckage stopped them being seriously injured as one of the climbers hit the propeller on his way down the gully. It made big news in the Press! In 2011 on the 60 th Anniversary of the Crash at the exact date a group of serving RAF MRT & Torridon MRT went up to crash site. The actual weather according to Joss Gosling who was on the actual search for the aircraft was very similar. We had thigh deep snow and the journey into the corrie took over 3 hours. BBC Radio Scotland accompanied us on the day and did a programme on the incident. We had a moving ceremony at the crash site, where we left a small wreath. The Stornoway Coastguard helicopter flew over the site as the weather came in making it a very moving day. Joss now in his 80’s was interviewed by the BBC Scotland at the Hotel where the team had camped 60 years before. What a story to tell and it still lives on and must never be forgotten. Recently in 2013/2014 and 2016 a relative of the incident Geoff Strong a nephew of Fg Off Robert Strong who was killed in the crash asked to visit the crash site. He lives down South and has now three times made the pilgrimage with myself and friends to the great Corrie. This place even after all these years after the 1951 crash mean so much to many. People ask why do I visit these places? Just speak to Geoff and then look in Joss eyes who was there when he tells his story of a young lad in 1951. RAF Kinloss Mountain Rescue have now been disbanded and there place taken by RAF Lossiemouth MRT. The memorial has been moved from Kinloss to Lossiemouth and I would appreciate a photo of it? I still would? I head up again this May 2107 with Geoff and this time Heather Joss’s daughter to visit the site and may be go over the tops with Heather. Joss is now in his late 80’s and is excited his daughter is going up to see a place that means so much to him. It was great to see that the RAF MR were up the gully this week March 2017 and the tradition lives on as do the teams. Take care and it is great to see an event such as this still not forgotten. Still looking for a photo of the new memorial! In May 2018 I was up again at the crash site with Geoff and Heather, Ian and Andy Joss’s family. We had a new plaque to put on the propeller below the Triple Buttress. Unfortunately the old plaque was put on in 2001 to last and it will take a bit more time to replace it with the new slate one. Joss though not well came up and stayed in a local Hotel and had a meal with us after our wet day on the hill. Though Joss was not well he enjoyed the day and at the end his eyes were sparkling. We hope to replace the plaque in 2019 and the family will be with us. Later in the summer the old memorial at RAF Lossiemouth was finally moved to outside the Mountain Rescue Team HQ at Lossiemouth. Joss and his family were there and we had a lovely day thanks to all those who organised it. Sadly in November Joss passed away in Fort William surrounded by his loving family his memory will live on every time we visit Torridon and Beinn Eighe. This entry was posted in Aircraft incidents, Articles, Mountain rescue, mountain safety, Mountaineering, Scottish winter climbing., SMC/SMT, Views Mountaineering, Weather. Bookmark the permalink.